Adding or burning off fuel will mainly change the amount of weight on your steer axle and somewhat on your drive axles also, depending upon the placement of your fuel tanks. The bridge law formula limits the maximum amount of weight you can carry across any set of axles based upon the number of axles and the spacing between them (we'll discuss this formula soon). When distributing weight across a set of axles, you will ultimately be limited by the most restrictive law for any given situation. For instance, if the law states that you can carry 20,000 pounds on your steer axle, but your steer tires have a load rating of 6000 pounds each, then you can only carry a total of 12,000 pounds on your steer axle. Another example would be a situation where you have 35,000 pounds on your trailer tandems, but only 28,000 pounds on your drive axles. Even though you may be able to slide your trailer tandems back far enough to get the weight distribution legal across all axles, if you have to slide them back beyond the legal limit allowed from trailer kingpin to trailer tandems, you will still be illegal. The weight distribution of the load itself would have to be changed in order to get your truck legal in this circumstance. So you must comply with all of the various laws in order to be legal on the highway. We will be covering a variety of different scenarios throughout the remainder of this section. This information is critical. You must know this inside and out to effectively redistribute the weight across the axles. Memorize it and understand it well. The trailer kingpin is a metal pin found underneath the front of the trailer which the 5th wheel of the tractor latches onto to lock the tractor to the trailer. What is the main factor that will limit how far back you can slide your tandems? 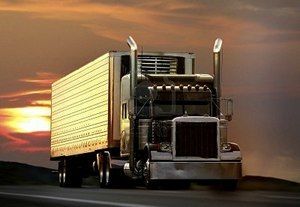 The distance between your steer axle and drive axles or "tractor length rating"
You have steer tires rated at 6,150 pounds each, and you're in the state of West Virginia which says the legal limit for the steer axle is 20,000 pounds. What's the maximum legal weight you can carry on your steer axle in West Virginia? Your steer tires are rated at 6,150 pounds and you have two of them on your steer axle. Therefore you can carry a total of 12,300 pounds (6,150 x 2) on your steer axle. Because you can not legally exceed the load rating of your tires, the fact that West Virginia allows 20,000 pounds on the steer axle doesn't matter. You're ultimately limited by the most restrictive law, which in this case is related to exceeding the steer tire load rating. Sliding your trailer tandems forward or backward will redistribute the weight mainly between which two sets of axles? You may find a slight change in the weight of your steer axle after sliding your tandems, but it won't be very much and it's rarely much of a concern. Sliding your 5th wheel will redistribute the weight mainly between which two sets of axles? Which of the following techniques will not change the weight distribution across your axles? If you move the center of gravity either toward the front or rear of the trailer, it will change the weight distribution across the axles. But raising or lowering the center of gravity of the load will not change its weight distribution across the axles. In the following picture, what are axles 2 and 3 commonly referred to as? "tandems" or "front trailer tandems"
You'll normally hear drivers refer to these two axles as your "drives". They'll say, "The other day I scaled out and my 'drives' were over by 800 pounds". In the following picture, what are axles 4 and 5 commonly referred to as? "trailer set" or "back tandems"
"trailer drives" or "back tandems"
"back set" or "rear tandems"
You'll generally hear drivers refer to these axles as simply "tandems". They'll say "The load I had yesterday was loaded incorrectly and I was overweight on my 'tandems' ".